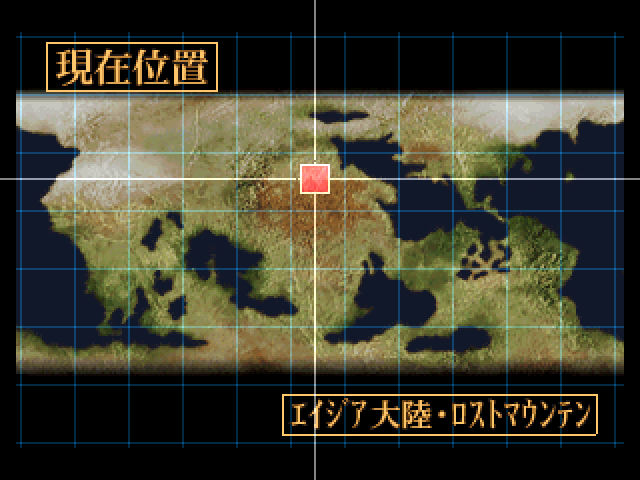 A quick reminder to avoid confusion; This is the Intermission that plays at the end of the Moon Route, which is the 'official' route for this LP. : Kind of obvious now, but... Guess he's still alive and kicking, huh. : Yes... Along with all their grudges toward us, swelling out of the magma. : I only know about the battle with the Dinosaur Empire from the year S.E. 186 through data, but... How much battle power do they have? : What they just sent was probably only a fraction of it. We got sent here through time. They, on the other hand, have had all the time in the world to build their strength... There's frankly no telling what they could have by now. 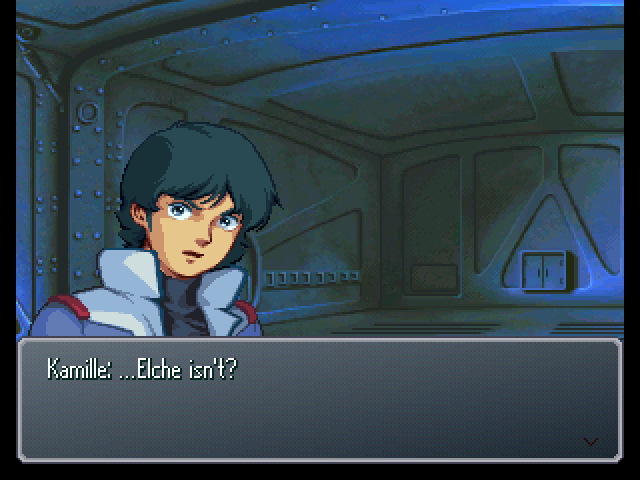 : What we must treat with the utmost concern is their main base, Machineland. : Yes, sir. It is a gigantic mobile fortress which moves freely in magma. : That's what makes it hard for us to pinpoint their location. : An elusive base of operations, hm. That is quite troublesome. : Actually, I'd like to investigate the Mountain Cycle in this area's vicinity. : Can't hurt, just in case. It shouldn't take too long. : All right. I'll allow it. : Not going back to normal... 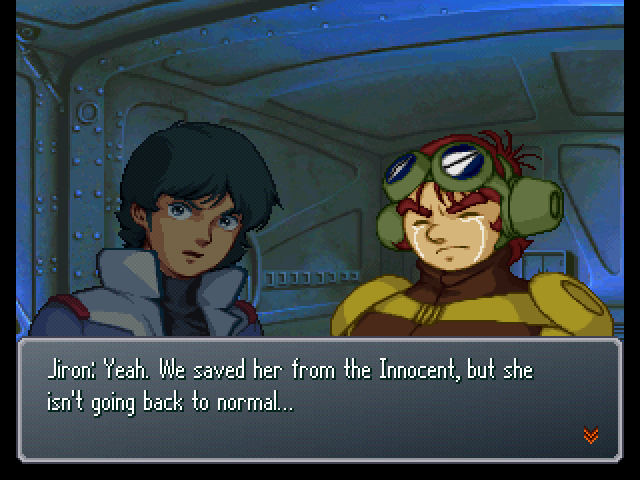 The Innocent's brainwashing hasn't been undone? : The White Doll has that much power...? : Contact with the Turn X must be making the White Doll regain its original functionality. 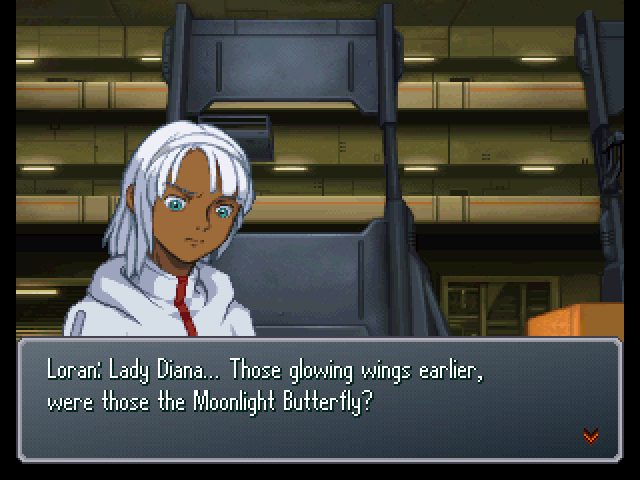 : But I saw the Turn-A's Moonlight Butterfly save Ryouma's group, too. Depending on how it's used, it could turn out to be an incredibly powerful asset. 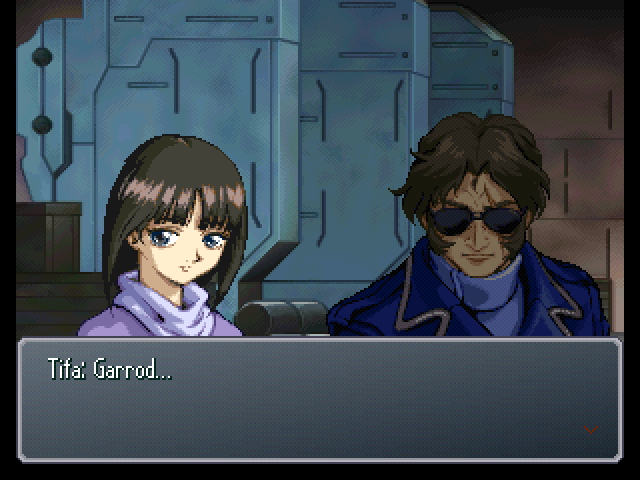 : (.........) If the White Doll is a mobile suit burdened with past sins... I'll make use of its power for good. It's just a tool, so what matters most should be how one uses it. : Yeah, when we were doing some tests with our Elemental Lords. : Not exactly. Actually, Elementals and Elemental Lords have trouble bringing out their original power... On the surface, where spiritual power grows weakened. So, to get them a little closer to the functionality they had on La Gias... Cenia and Wendy made some adjustments to the output levels on our Prana Converters. 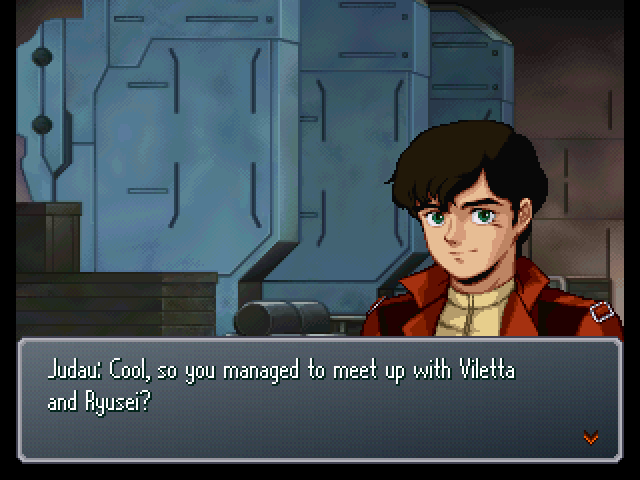 : So, you basically got a power-up. : Not too huge of one, but... We can use some new moves now. : New moves...? Like what? : See for yourself when we use 'em. : Wasn't the R-1 dismantled? : Yeah... Astonaige dug this one up from a nearby Mountain Cycle. : And, what's the verdict? : Like I figured, it's not the R-1 I used. The weapons are a little different... And the personal mark I put on mine isn't there. 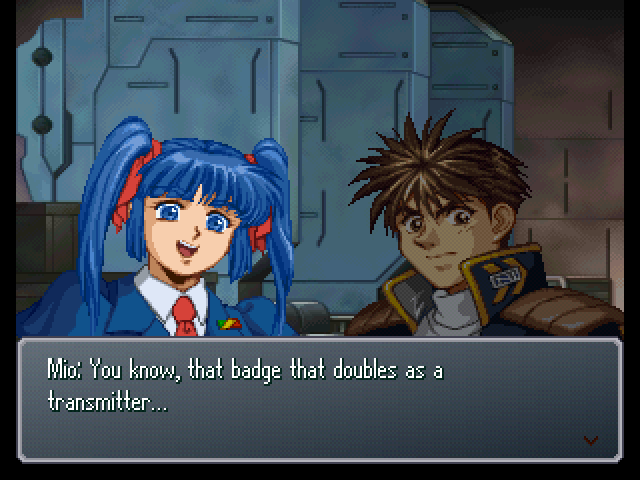 : Ooh, ooh, I bet I know what your personal mark is, Ryusei. It's "that," right? : (.........) ...What about the combination mechanism? 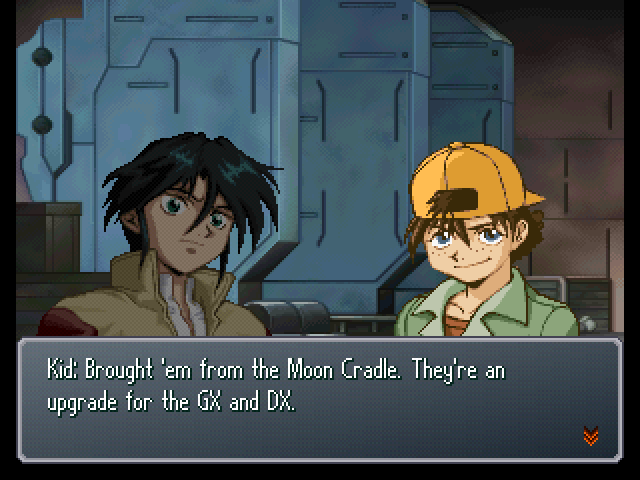 : It's unusable, so the R-1 won't be able to combine into SRX. 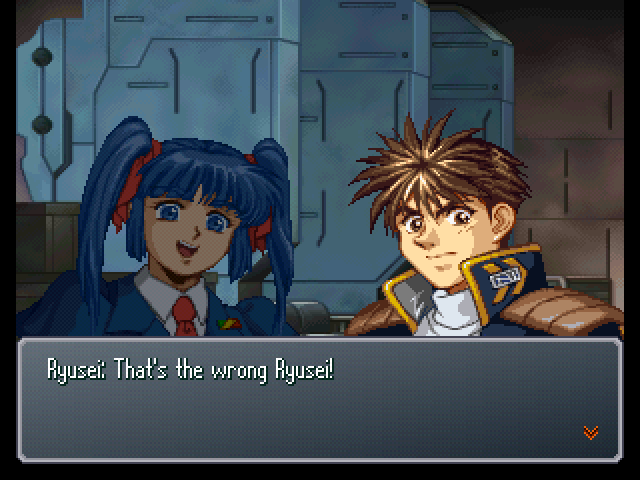 : The R-Series had a few other units, didn't it? You didn't find any of those? 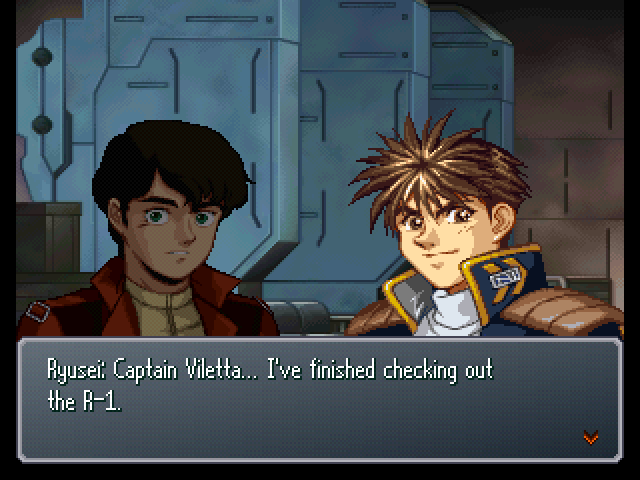 : (.........) Captain Viletta, I'm going to join the others and fight in the R-1. I should protect this era's peace, too. : So, what mark will you put on it this time? : ...It'll take a pretty darned long time to fix it up. 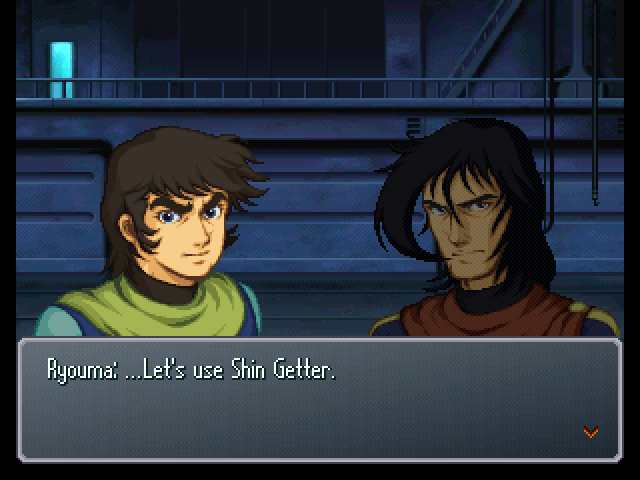 : Do we use Shin Getter? Or wait for Dragon's repairs to be finished? 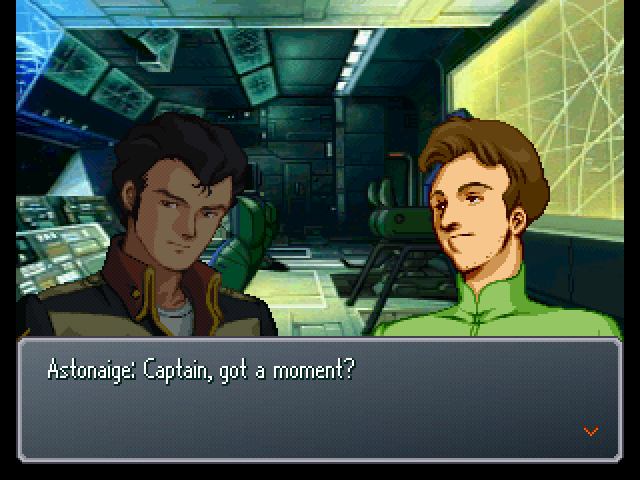 : ...All right. With that decided, let's get to work on this thing quick. Musashi, Benkei... You guys mind lending a hand, too? 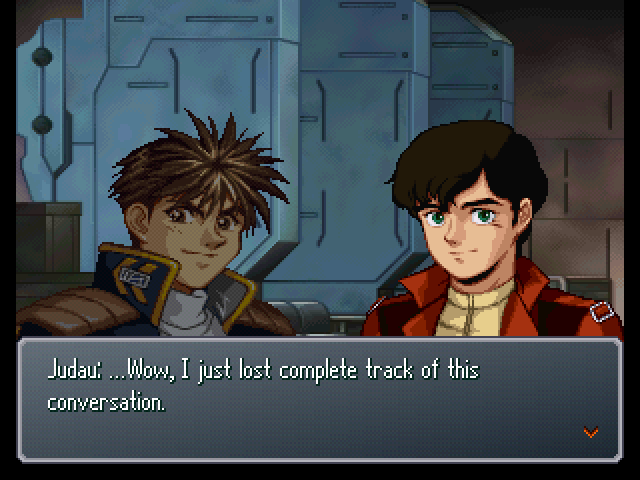 Hayato, Musashi, and Benkei leave. : Jamil? Oh, you mean the guy who ordered me to retrieve them? : The fighting is only going to get tougher. To save the world, we should use every means at our disposal. 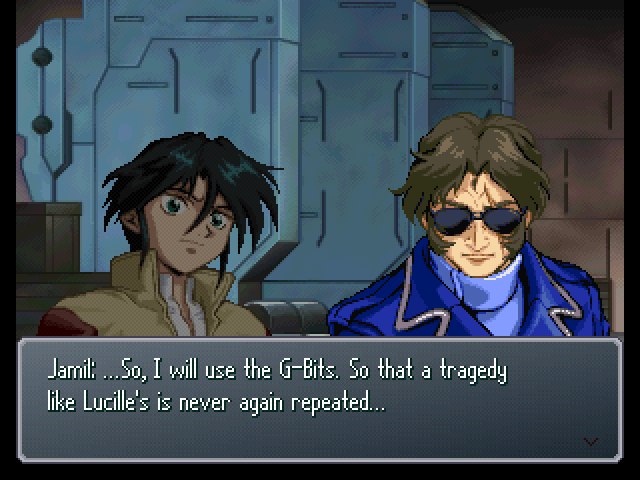 : With the G-Bits, the GX and DX can both fight great even when not firing the Satellite Cannon. 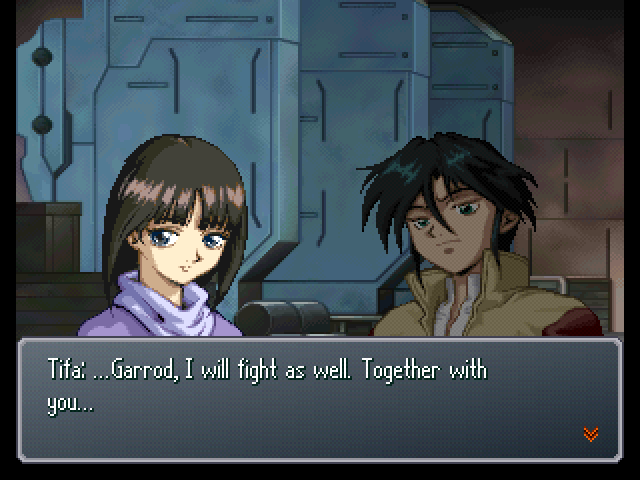 The only two that can use them are Jamil and Caris, though. : Tifa? What is it? : T-together...? 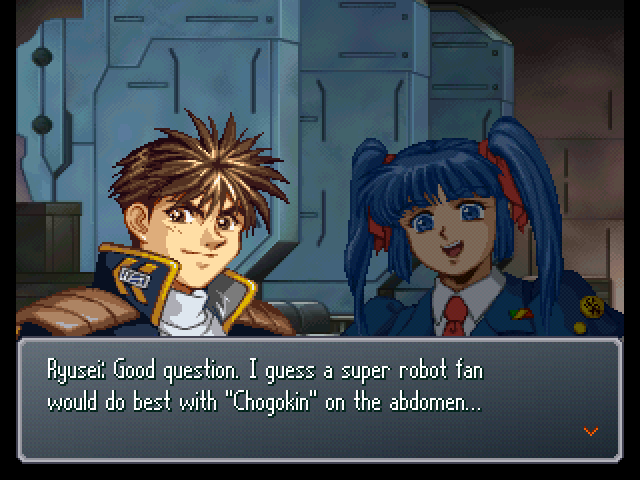 You mean in the same mobile suit!? You only get the above scene if you fulfill the requirements for the G-bits. 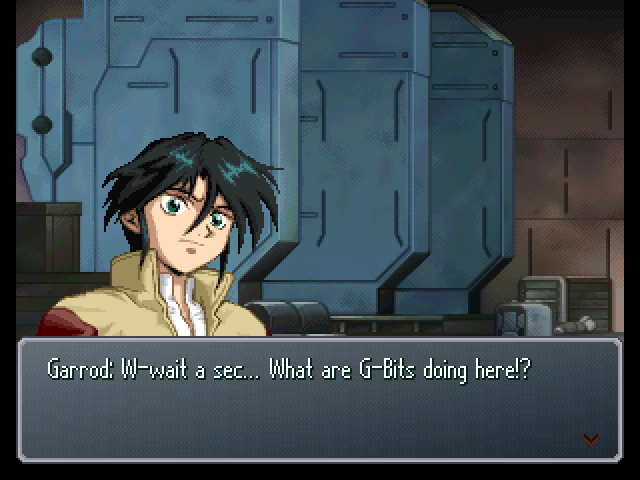 : Shin Getter seems to be performing self-repairs, but... The Shine Spark it took in the last fight did a major number on its Getter reactor. 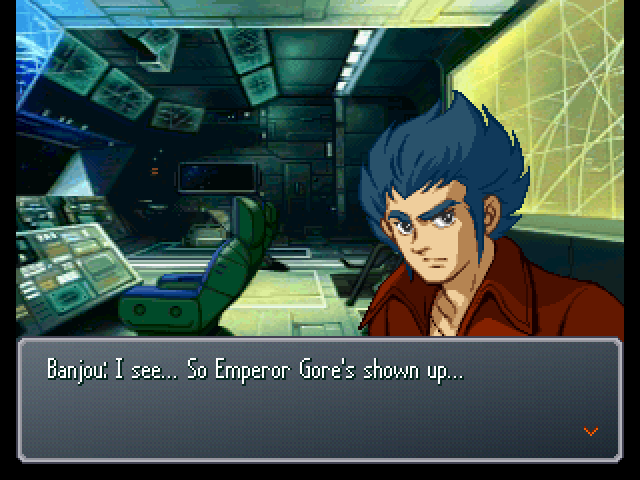 : ...No, we'll seal away Shin Getter as-is. : Yes. 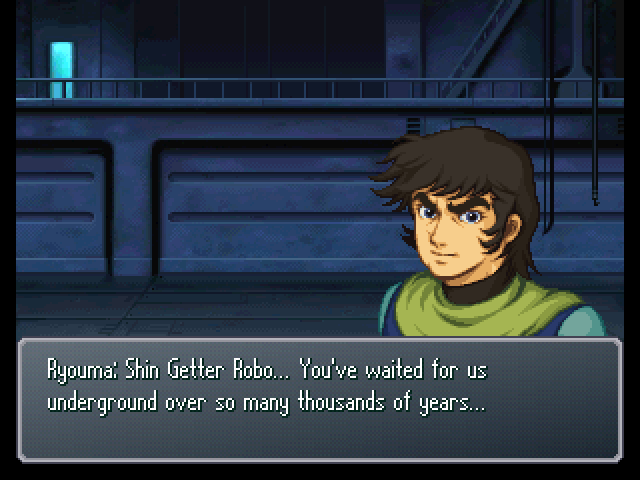 When I first fought Shin Getter, I realized... For us... No, for humanity at large, Shin Getter is far too much to handle. : Even facing the Dinosaur Empire... It's not something that we should be resorting to using. 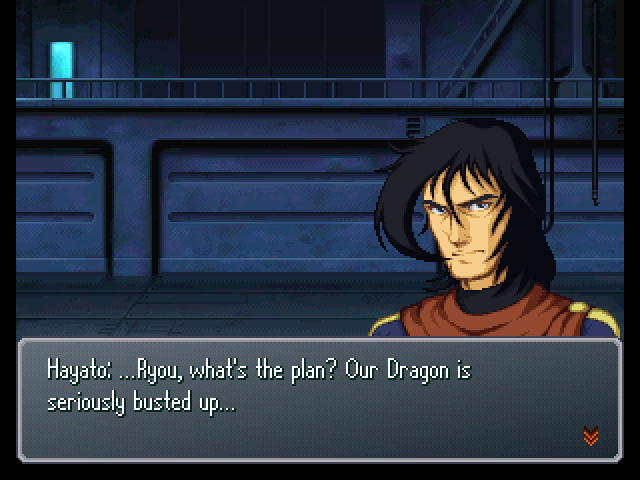 So we're going to continue fighting in Getter Dragon. And... this time, for the sake of the people in this era, mark my words, we will defeat the Dinosaur Empire...!